Former UDF whip and honorable member of the legislative assembly (MLA) of Kerala Mr. P.C. George visited Gulf Medical University (GMU), Ajman, on the 17th September 2016, where he toured the GMU campus as well as Thumbay Hospital and praised the use of modern technology, scientific strategy and the availability of varied courses that enable medical students to take up challenging responsibilities of the future. 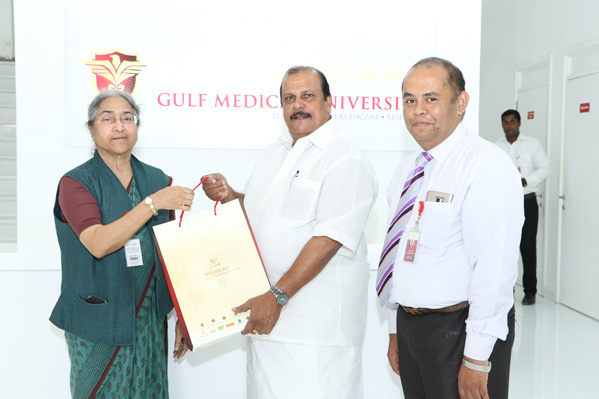 The Indian MLA was welcomed by the GMU Provost, Prof. Gita Ashok Raj. Mr. George began the day at the GMU campus with a presentation ceremony, where he was, offered insights into the operations of the teaching hospital and a glimpse of Dubai’s vibrant healthcare facilities. As one of the most sought-after medical institution of the United Arab Emirates, today GMU not only hosts a number of international students and faculty, but also provides a strong platform for innovation and research with its dedicated Center for Advanced Biomedical Research and Innovation (CABRI), the Center for Advanced Simulation in Healthcare (CASH and the region’s first-of-its kind Innovation Centre armed with devoted innovation and incubation laboratories. During the tour, Mr. George commended the philosophy of GMU University, its plans and modern means of education. The tour concluded with a visit to Thumbay’ facilities such as world-class laboratories, research centres and a meet with deans and faculty members. 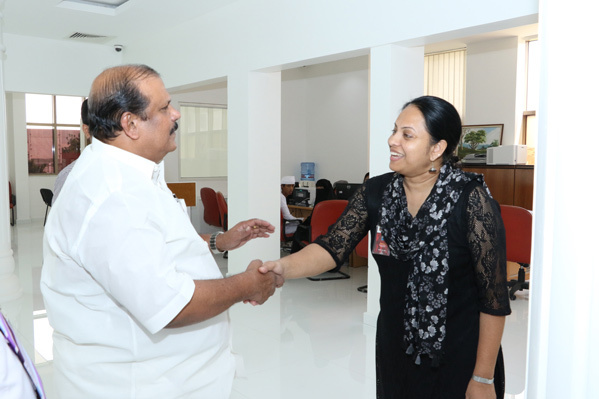 In a statement, founder president Mr. Thumbay Moideen said he was delighted by MLA P.C. George’s visit and added, “Today’s meeting conveyed an important message that Thumbay Hospital and GMU campus work towards affordable, quality healthcare for every single soul, without commercialization-a standing testament of commitment and dedication of the medical and healthcare fraternity towards society. The Gulf Medical University (GMU), owned and operated by Thumbay Group headquartered in DIFC (Dubai), is presently the most sought-after private medical university in the UAE. It is the first private medical university in UAE catering to all nationalities admitting students of both genders, presently having students from over 73 nationalities, and faculty and staff from 22 nations. GMU offers a range of courses including MBBS, BPT, DMD, PharmD and Masters Programs in Clinical Pathology, Public Health, and Toxicology. GMU is first in the region to launch unique programs like Masters in Human Reproductive Biology, Bachelor of Biomedical Sciences and Masters in Physical Therapy. GMU’s campus is equipped with dedicated research centres such as Centre for Advanced Biomedical Research and Innovation (CABRI), the biggest laboratory chain in UAE with four full-fledged laboratories and sample collection centers across the various Emirates, and the Center for Advanced Simulation in Healthcare (CASH), a multidisciplinary educational facility integrating simulation as an educational tool for providing a state-of-the-art, safe learning environment that promotes professional development.